If you’re a Seattleite you’re well aware of the deliciousness that Skillet cranks out. If you’re not, well then you’d better hop on a plane and come visit us - we have something good to share with you! Skillet Street Food started in 2007, the mobile creation of Chef Josh Henderson. Henderson began serving innovative American fusion-style food using local and seasonal ingredients out of a vintage Airstream trailer - both the trailer and food becoming an immediate hit with eager diners searching social media for its location of the day. 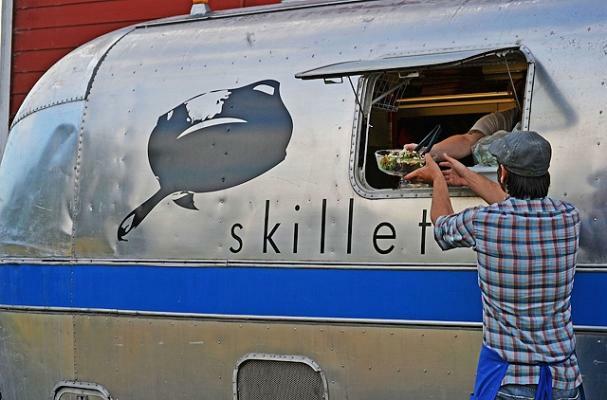 Since then the company has grown, now operating two Airstream food trucks and three brick-and-mortar restaurants they call Skillet Counters. Don’t be deterred by the long lines for Skillet is well worth the wait (hello, bacon jam-topped burgers)! And they recently expanded even more, offering full service catering. 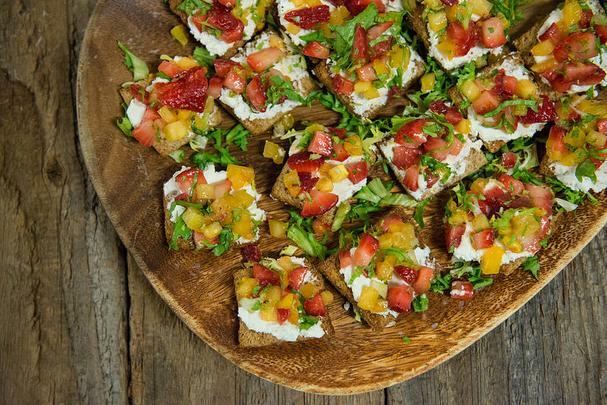 Trust me, you'll want Skillet to cater your shindig (yum!). Their full service catering can offer you as little or as much as you need for your party - go with family style, buffet, stationed or passed bites, or have your guests get their food right from of one of the trucks. Their redefined modern American food is elegant yet approachable. 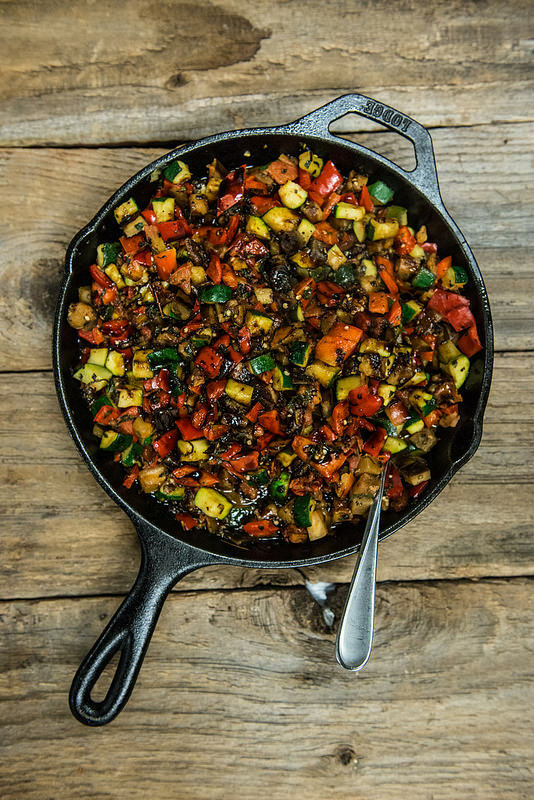 Their Northwest Summer Menu includes dishes such as Summer Vegetable Ratatouille (above), a colorful mélange of zucchini, eggplant, red pepper, Roma tomato, rosemary and basil; and Strawberry Yellow Tomato Tartine (below) with goat cheese, frisée and a tarragon vinaigrette. 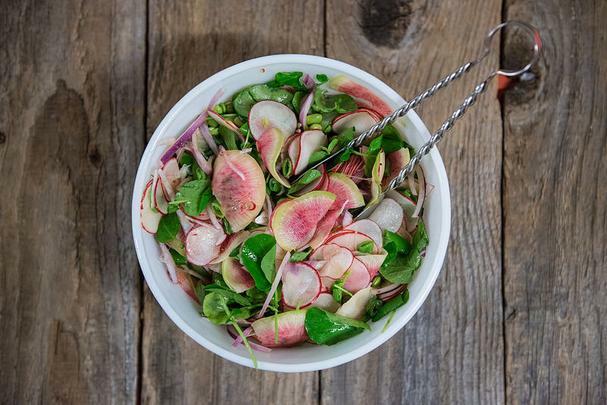 Their Korean Fushion Menu features vibrant plates like Summer Radish Salad (below), a colorful dish of watermelon and French breakfast radishes, shaved red onion, watercress, and snap peas tossed in a sweet chili vinaigrette. 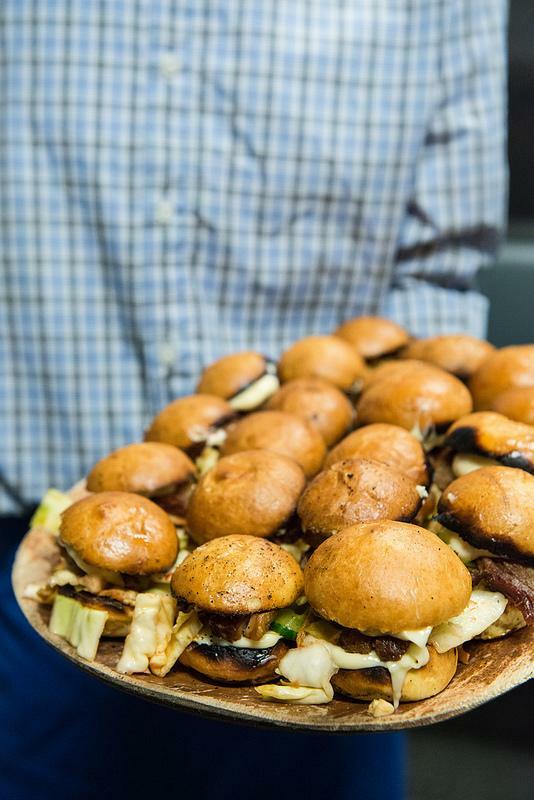 Their Kalbi-style barbecued beef short ribs are a finger-lickin’-good must-have, as are the Crispy Pork Belly Sliders which are topped with a mild kimchi and chili mayo. The Salmon Bulgogi is a personal favorite of mine, especially alongside a seared sticky rice cake or two. Or, go down home with their Southern Comfort Menu featuring Coconut Shrimp Beignets, Jalapeño Cornbread and Skillet’s famous fennel seed crusted Fried Chicken that’s drizzled with honey pepper. Oh, yeah. Makes you want to throw a Skillet party just for the heck of it, doesn’t it? Check out Skillet Street Food here for menus, locations, and products (yup, you can buy their famous Bacon Jam and more online). Images from Ben + Amaia, Red Barn Studios courtesy of Skillet Street Food.